Lev Glazman and Alina Roytberg created the perfect gift, a set of soaps wrapped in artisanal paper, tied with a delicate wire, and topped with a semi-precious stone. With their amazing scents and nourishing formula, these soaps were the start of Fresh. Born in Boston and raised in New York, the brand has evolved into a full line of lifestyle products spanning skincare, bodycare, fragrance, haircare and home. Rose Face Mask hydrates and tones the complexion to restore radiance and suppleness to all skin types. The unique, cooling gel formula is infused with real rose petals that literally melt into the skin. Pure rosewater is notable for its soothing and toning properties. I am very happy that I could test their mask thanks to one of the website with all kinds of free products / samples about which I mentioned in the post How to get free cosmetics in Uk? This is my first contact with this brand but I hope not the last one. I have to admit that this Rose Mask is very efficient because the 1.5 ml packaging was enough for about 5/6 using and I put a pretty thick layer: D. After opening the jar immediately a thought comes to mind that it looks and smells just like marmalade or fruit mousse. It has a strong scent of rose but it's so natural like real rose, totally not artificial if you know what I mean. The skin after application is noticeably more moisturized and so plump as if firmed from the inside. This effect lasts for a long time not as in the case of many other masks containing artificial ingredients, that the skin looks moisturized and had some beneficial effect but only in the first 10 minutes after that the magic disappears. It really surprised me positively because the face is definitely softer and noticeably in better condition. Costs £52 for 100ml at a regular price or £21 for 30ml. I am pleased that I could test this mask and I will have this brand on my radar. 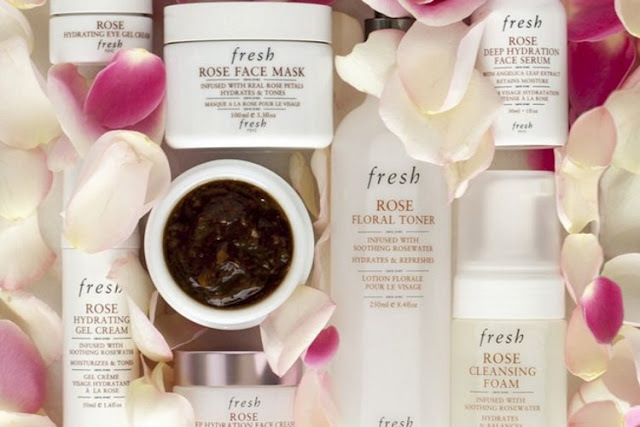 If only you have the opportunity to take a sample or you are into natural skin care and you don't bother about such a high price, I can truly recommend Fresh Rose Face Mask. Have you ever tried products from Fresh? Do you prefer cheaper or more expensive skincare? I need to try! Love face masks! Bardzo interesująca marka . Chyba poczytam o niej więcej zainspirowałaś mnie.